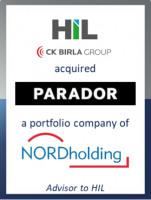 GCA acted as exclusive financial advisor to HIL Limited (NSE: HIL), a leading building material construction company in India, on a definitive agreement with NORD Holding to acquire its German subsidiary Parador Holding GmbH, a vertically integrated, full-range supplier of flooring solutions. HIL, which is part of the $1.8 billion diversified CK Birla Group, has been operating for 70 years and enjoys a market-leading position in the building materials segment in India, providing fibre cement sheets, solid wall panels, fly-ash blocks, pipes and fittings as well as other building solutions. HIL is a pioneer of certified green building products in India and has been recognized as ‘Asia’s Most Trusted Building Material Company’ in 2016 and 2017 by IBC INFOMEDIA. Founded in 1977, Parador, is a vertically integrated, full-range supplier which designs, manufactures and distributes a wide range of flooring solutions including resilient flooring, laminate and engineered wood floors, wall and ceiling panels, skirtings and related accessories. Parador is the category leader in design and innovation with all products developed internally and made in Germany and Austria. Parador has long-standing relationships with all major customers in Europe. The acquisition will enable HIL to transition into a global player in the Building Materials segment and facilitate its entry into Flooring Solutions, a segment which is highly complementary to HIL’s current product portfolio. HIL will also benefit from Parador’s renowned brand, strong R&D and design capabilities. The transaction, which is subject to regulatory approvals and expected to close by end of August 2018, marks the first successful collaboration involving GCA’s European business, GCA Altium, and GCA India, underscoring the firm’s strong cross-border capabilities.